In Brief: The bouldery scenery and streams of Shuiquan Canyon have been somewhat spoiled by a buildup of trash and litter. Help us clean up! 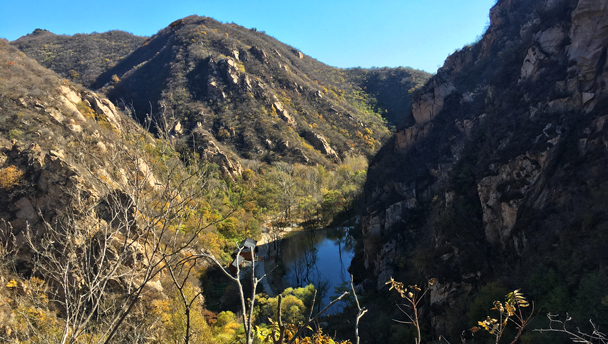 Join the clean up for Earth Day, and do your part to keep Shuiquan Canyon clean and green. No pizza—the Jiankou Great Wall is shut down for the One Belt One Road Forum, which means we can’t hit up the Gung Ho! Hut for pizza after the clean up. We’ll provide snacks and drinks instead, and we’ve rescheduled the Jiankou Clean Up and Pizza to Sunday, May 19. Hike hill trails and valley paths to on the way to Shuiquan Canyon, a bouldery valley in the Longquanyu area. The route through the canyon takes us around and over several large pools as we walk below cliffs and over rickety bridges, hiking over and around boulders on the way to the end. The hike is of moderate difficulty, with some balance required to cross stepping stones. Walk down a long road through villages to get to the trail that leads to the canyon. Hike up and out the canyon, keeping an eye out for things to pick up. As well as clearing trash out of the canyon, we’ll be setting an example for other hikers we see on the trail.